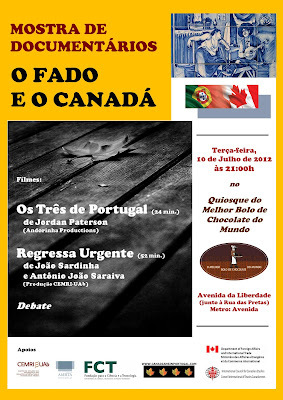 Yes, on Tuesday, July 10th at 21:00 we are hosting the Documentary Film Screening Fado and Canada outdoors at the Quiosque do Melhor Bolo de Chocolate do Mundo smack dab in the middle of Avenida da Liberdade. So what documentaries are these you ask? Well Os Três de Portugal (The Three of Portugal), a film by Vancouver-based filmmaker Jordan Paterson, tells the story of the fado trio going by the same name out of Vancouver. 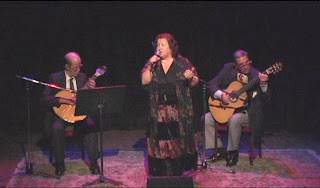 For 40 years Os Três de Portugal played and sang fado in BC's lower mainland. Quite the feat, there's no arguing that! The documentary sets out to reveal how these three Portuguese emigrant fadistas attempt to preserve the Portuguese national song in a new cultural context and to decipher what fado tradition mean for "The Three of Portugal" far from its land of origin. The second documentary is one we've previously written about here on this blog. Regressa Urgente (Return Urgent) ﻿by João Sardinha (one of the two contributers of this blog) and António João Saraiva, captures the story of Marta Raposo, a Luso-Canadian fado singer who moved to Portugal in 2005 in the hopes of affirming herself as a fado singer in Portugal. Regressa Urgente catches up with Marta five years into her fado journey in Portugal, at a time when she was again preparing to return to Canada; a pivotal period that ended up triggering divided feelings of belonging, carrying with them doubts and regrets. So these are our offerings. Hope to see some of you who follow this blog out on July 10th, and hey, in the end even if you don't like the docs., there'll always be the chocolate cake. In this great scheme of things you actually receive an A just for hard work. the conclusion. For right now I will subscribe to your issue but trust in the foreseeable future you link your dots better. individually imagine it from so many various angles. Lady gaga! Your personal stuffs great. All the time take care of it up! this in my search for one thing regarding this.